Gloria Steinem is a feminist. I am feminist. Therefore, I should know everything about Gloria Steinem, right? In reality, I don’t know enough about her. I know how important she is and the overarching things she has achieved, but when it comes to her personal life, I am mostly unaware. Although this Kindle Single is less than 40 pages, I feel like I understand her a bit more having read it and am eager to read a more in-depth biography of her and her achievements. 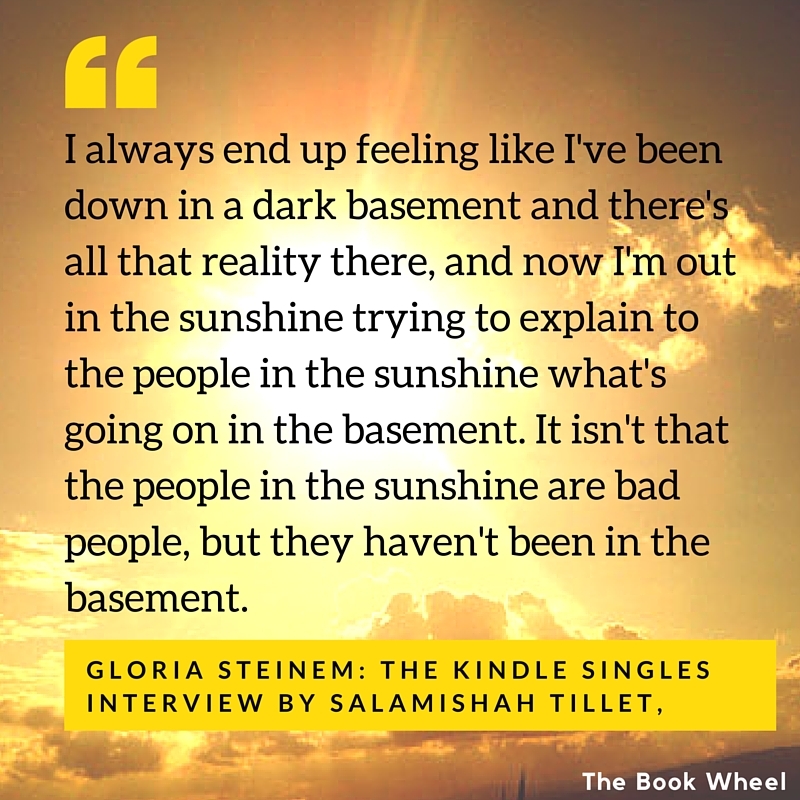 Gloria Steinem: The Kindle Singles Interview by Salamishah Tillet is less about Steinem’s work and advocacy than it is a casual conversation about her general thoughts on feminism. It begins with her childhood, ventures into her activism, and ends with her hopes for the future. She quickly jumps around from topic to topic, offering quick insights into her thoughts on how her parents helped shape who she is today, the problem with the George Zimmerman trial’s exclusion of his prior anti-women behavior, her insecurities about preaching feminism when she didn’t have kids of her own, and her support of Sheryl Sandberg’s Lean In. She chimes in on why she defended Marilyn Monroe, her regrets regarding the Hillary Clinton piece she did in 2008, and how feminism and foreign policy are intricately connected. Despite the rapid fire Q&A, Steinem managed to say a lot in just a few words and it left me thinking about the issues that she raised for much longer than it took to read the interview. Some of it enraged me (sexual abuse in the military), some inspired me (her hopes for the future), and some was downright frustrating (the having-it-all conversation). The important thing, however, is that all of it made me think and in a time when certain politicians are doing everything in their power to maintain their white, male dominance, the interview served as an important reminder that we still have work to do. Recommended for: Everyone. It’s less than 40 pages! Plus, it’s free with Kindle Unlimited!